The 2013 Quality Standard Award in Multichannel Relationship is the result of a study conducted by the "Consumidor Moderno" (Modern Consumer) magazine, with the technical and analytical coordination of E-Consulting. The study highlights the solutions used in in-house and outsourcing contact centres that are best able to provide good services to consumers in several multimedia channels in Brazil. This is the most complete analysis of the evolution of the multichannel operations in the country. Based on this analysis, Teleopti won the 2013 Quality Standard Award in Multichannel Relationship in the PERFORMANCE MANAGEMENT category. 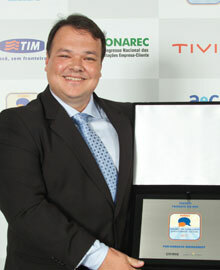 "We are honored to receive the Quality Standard Award for Multichannel Relationship. We are very grateful to our customers and partners for such important recognition. Today Teleopti is recommended by 9 out of 10 of our customers worldwide, and a leader of WFM in key markets such as Europe, Asia and the Middle East. It is of great satisfaction for us to generate such impressive feedback from our customers in Brazil, which is a result of implementing a fast and efficient solution in all levels of the organization, improving the work of the Agents, Managers and Executives. This award is truly a milestone in Teleopti’s 20 year history. "